* If the image is too small, use the "Watch on YouTube.com" and "Full Screen" settings at the bottom right part of the image. High 700-cd/m2 brightness and 5,000:1 contrast ensure excellent, eye-catching visibility even in large public spaces. This greatly increases the promotional value for signage use. 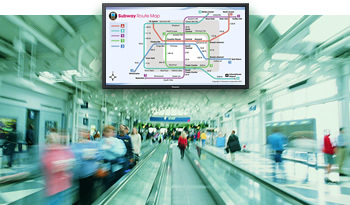 Large screen and high brightness provide up-to-date information for facilities. Since the protective glass fits inside the bezel, the external dimensions remain virtually the same. 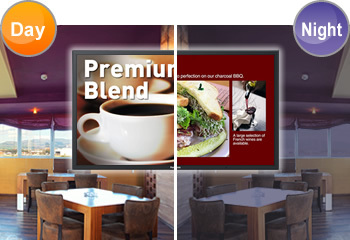 The glass protects the LCD panel surface so the display can be installed in busy public areas. The tough design makes the display panel suitable for use as signage that operates all day and night in places such as restaurants, shopping malls and transportation facilities. The edge light system requires a small number of LED units because the lights are installed only on the edges of the LCD panel. This saves energy. The display unit can also be made thin and light. A built-in ambient light sensor detects ambient light and controls brightness. 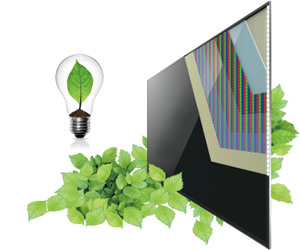 Low power consumption is achieved by controlling the brightness of the backlight. 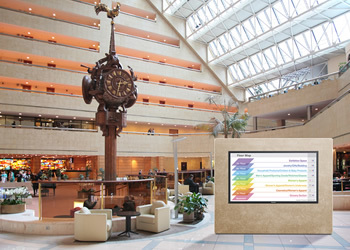 The display can be installed in a permanent hanging position using eyebolts. Wall-mount brackets and hanging fixtures in compliance with VESA specifications can also be used for flexible installation.